Looking for the right chocolates for your sweetheart? We found them. There is no doubt that we at The Inlander are gluttons for punishment. But more to the point, we are gluttons. Each time we do one of these food throw-downs, we proclaim that it will be the last one. Or that we’re filing a grievance with Labor & Industries. There is one thing, though, that we will risk our lives on: dessert. And February is the time of year to put the old sweet tooth to work. 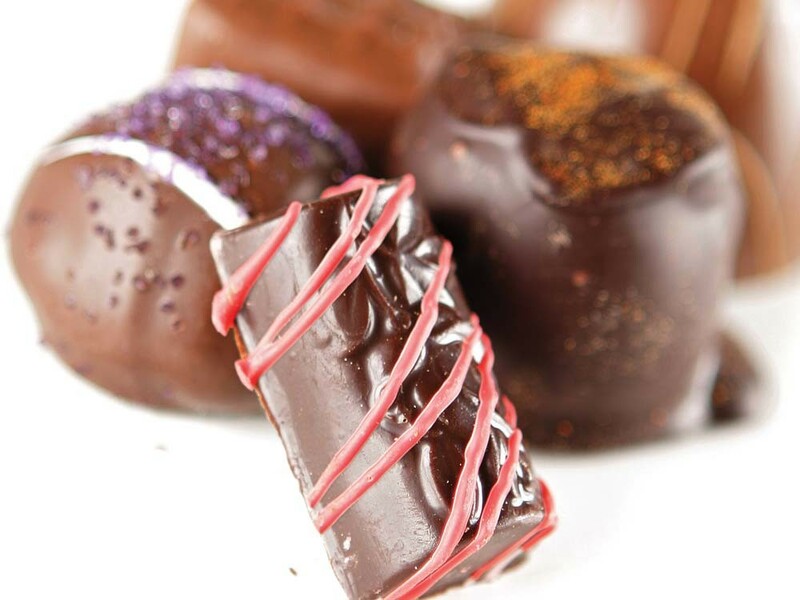 With Valentine’s Day around the corner, we decided, why not put Spokane’s chocolates to the test? Forty-eight hours, 45 chocolates, some antacid and a lot of complaining later, we give you our official results: the best chocolates in the Inland Northwest. To start, we assembled our testers: Jordy Byrd, The Inlander’s relief pitcher, is a self-proclaimed chocoholic. She was in. Luke Baumgarten — he’s the guy that came up with these throw-downs in the first place — was in by default. And then Leah: She’s more of a candy fan, but she loves a guy who is a chocoholic and really just wanted to know what to get him for Valentine’s Day. We all consider ourselves to be spiceavores. We can handle heat. We even look for it. This category, though, made us re-think our Sriracha-goes-with-anything ways. A mere 11 points separated best from worst, but we had sharp differences on Hallett’s habañero caramel ($.80), which took the bottom. Jordy thought the dark chocolate went well with the habañero oil, while Leah and Luke thought it was spicy for the sake of spiciness. Chocolate Apothecary’s Spicy Maya ($1.25) was a nice mix of woodsiness and spice. Nothing spectacular, but a good all-around chocolate. It’s a classic combination: Chocolate plus peanut butter equals tasty and delicious. But a few local chocolatiers screwed with the equation. Hallett’s Melty ($.40) came in last with their chalky peanut butter filling. Nonetheless, Leah says she could see herself eating a whole box of these in front of the television. Though Chocolate Apothecary’s Peanut Butter Dome ($1.25) scored high in presentation points, it placed third: The hybrid peanut butter filling tasted synthetic. Spokandy took second place with their sweet, salty Peanut Butter Smoothie ($.80), which was good but trod a fine line between gourmet candy and Reese’s. We thought we’d include Huckleberry since it’s kind of a regional specialty. We discovered that, despite that fact, local candy-makers have not quite wrapped their minds around how to tame the Inland Northwest’s signature wild bush berry. Observe: Hallett’s did not fare well here — their medicine-y, Tangy, ultraviolet Huckleberry Bliss ($.70) earned a solid F.
To Idaho we went. Coeur d’Alene Chocolates certainly upped the ante with its huckleberry butter cream ($.80). What bumped this one to second place was that it tasted like fruit. Novel idea, right? But it was the butter cream’s overcompensation that was its demise. Sweetening up the fruit here caused the filling to be saccharine — making it taste more sweet, ultimately, than berry. When you look at four salted caramels on a plate, they pretty much look the same, except for the density of their salt crumbs. But what we learned quickly is that there is a world of difference inside each of them. Chocolate Apothecary’s Caramel by the Sea ($1.25) was quickly tossed into the garbage and last place after it almost ripped one judge’s front teeth from their cozy homes. And though Coeur d’Alene Chocolates’ sea salt caramel ($1.50) was delicious, it earned the bronze here due to its lack of saltiness — something we all noted. Plus the caramel wasn’t gooey — more sticky. Spokandy and French Quarter duked it out for supremacy here. Spokandy ($.80) earned extra points for the hefty salt — like a salt-rimmed margarita, you were tasting the salt before you even got to bite through the candy. But was it too much salt?